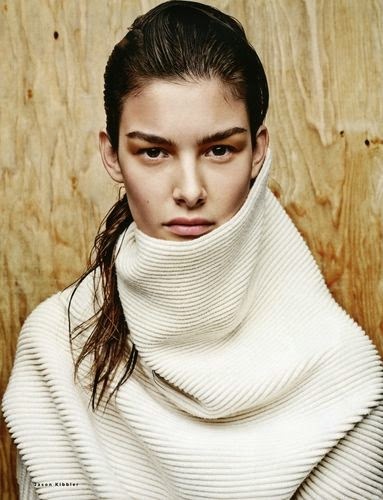 One newcomer who grabbed IMA's attention during the castings for Spring/Summer 2014 and has held it ever since is the impossibly divine Ophélie Guillermand. With her beguiling combination of French understated chic, light olive skin, and chestnut brown eyes, Guillermand was a comforting presence amongst the ubiquitous icy peroxide blondes infiltrating fashion's runways. Aged twenty and hailing from Verdun in the North-East of France, Guillermand debuted at the Fall/Winter 2013 collections however it wasn't until the Spring/Summer 2014 season that she truly made her mark with a stellar show list which included appearances at Alexander Wang, Calvin Klein, Marc Jacobs, Jil Sander, Nina Ricci, Valentino, and Balenciaga. Guillermand's mix of high fashion moxie and brooding sensuality have placed her on high alert with casting directors, designers and fashion editors culminating in a deluge of editorial and runway bookings. Photographed by Steven Meisel for Vogue Italia's December 2013 cover and Prada's Spring/Summer 2014 campaign, Guillermand's blue chip status has been consolidated by ensuing editorial appearances for Intermission, Another Magazine, W, and the German, Japanese, British and American editions of Vogue. Guillermand continues her dream run this month with an only girl editorial for Russian Vogue. Photographed by Jason Kibbler, Guillermand poses in head to toe knitwear styled by Olga Dunina with the clear emphasis being on her alluring visage.